Q: What is Dino Dudes tm ? A: It is a family game for 2-6 players. 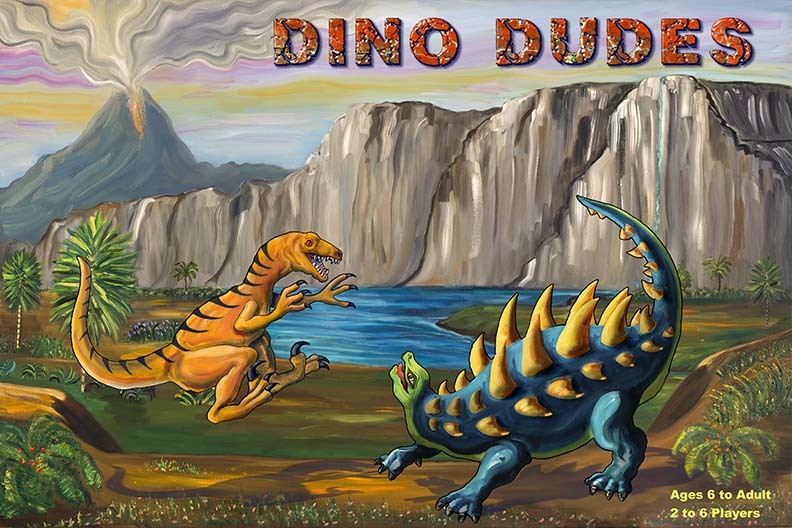 Dino Dudes tm is a dinosaur game with nice artwork. You play dinosaurs (printed on cards) into habitats (printed on placemats), and play goes from there. Q: What's all the commotion about? A: Dino Dudes tm has universal appeal, which is rare. Most people only like certain types of games, but everybody loves Dino Dudes tm. In 40 years of game design we have seen a lot of games, but have never seen a reaction like this. Everybody who playtested it wanted to play again (this never happens). This means sales are limited only to marketing and distribution. A weak effort will sell thousands of copies and a strong effort will sell millions. Q: When will Dino Dudes tm ship? A: Development is done. Artwork done. We are looking for an offer with the right marketing & distribution channel. We hope to make Christmas in 2018 or 2019. Q: Who wrote the rules? A: Ken Young. He specializes in clean, simple, easy-to-understand rules. Q: Who did all the habitats? Q: Who did all those dinosaurs? A: Tery Karvonen designed and sketched all the dinosaurs. She is incredible at drawing people and animals. Angela Young designed most of the color schemes and executed them in mixed media. She is incredible at bold colors and visual design. And you know how little bitty women with little bitty hands can have excellent brush control. We were fortunate to have access to artists of Angela & Tery's caliber. Q: Are there any variations or optional rules? A: Yes, Double Dino Dudes. Combine two games and then play. There can be two copies of the same habitat, with different dinosaurs in them. Up to 12 people can play, but the game bogs down a little with more than 8 people unless everybody knows how to play. Q: The game has a Triceratops. Didn't we just learn there was no such animal? A: That was debunked. The Triceratops was definitely a type of dinosaur. There was some evidence that the Triceratops might have been a juvenile Torosaurus, but that theory has been discredited. That's they way it goes when you study dinosaurs: Someone comes up with a theory, the idea gets traction, and then it gets discredited a few years later. Q: Why don't the Tyrannosaurus & Velociraptor pictures have feathers? A: They sort of do. We don't know if those dinos had feathers, so the artwork was unspecific (maybe they have feathers & maybe they don't). A dinosaur we think is related to the Tyrannosaurus had feathers, and one Velociraptor relative had dimples on some bones that look like the feather dimples on ostrich bones. But mammoths are hairy and elephants aren't, so we don't know if those two dinosaurs had feathers until we see a skin impression. There are partial skin impressions from Trex that show scales and not feathers. Q: Velociraptors are terror on legs in the movies. How dangerous were they really? While the cassowary is ill-tempered and sometimes attacks on sight, the velociraptor is a predator. The cassowary is mostly solitary, but there is evidence the velociraptor may be a pack hunter of large prey. The cassowary has a beak, but the velociraptor has teeth and clawed hands for grabbing. The velociraptor appears to be built for more speed than a cassowary. So the velociraptor is probably like a cassowary on wicked pills. But how dangerous is a cassowary? Really dangerous if one attacks you, yet the hunter-gatherers of New Guinea hunted them as their main prey with bows and spears. If there were velociraptors in New Guinea, the men there would probably have to hunt them in groups. Cassowaries live in forests and run 30mph. Velociraptors are built to run faster, so they can probably run 35-40mph. This is hard to manage in the woods, so they may have run down their prey in the open.